TEA BENEFIT Gyokuro tea helps in losing weight and in feeling vigorous and energetic, is abundant in antioxidants which are beneficial for speeding up the metabolism and burning calories and excess fat much faster. Brings a feeling of strength and health. 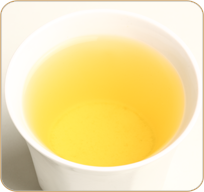 Gyokuro tea is very efficient in fighting free radicals and reducing the risk of tumors. It strengthens the immune system and fights harmful bacteria and cancer. This tea is abundant in antioxidants, minerals, vitamins and nutrients so it is very beneficial in reducing the risk of various cardiovascular diseases, lowering the levels of bad cholesterol in the blood and regulating the levels of sugar in the blood. DESCRIPTION Literally means �precious dew� in Japanese. Gyokuro has a dark green color, and when brewed it is slightly sweet, with a refreshing aroma. At least 20 days prior to harvesting, the tea leaves are shielded from sunlight. With less sunlight, there is less photosynthesis. Therefore, there is less L-theanine being converted into catechin when the leaves are under the shade. This is why gyokuro is rich in L-theanine and why it has its characteristic taste. Take one heaped teaspoon per 200 ml of freshly boiled water. Use a tea pot or a carafe. Let water cool for 60 seconds. Pour water onto the tea. Cover and brew for at least 1 to 3 minutes adjusting brewing time with strength and taste desired. Rinse pot after wards with hot water only. Do not use soap. Please do not add milk or sugar.